Sorry if this is a silly question just want to ask before I waste time on it. Is this possible with pfsense ? All I need it to do is route between two vlans all mdns / bonjour traffic and nothing else. 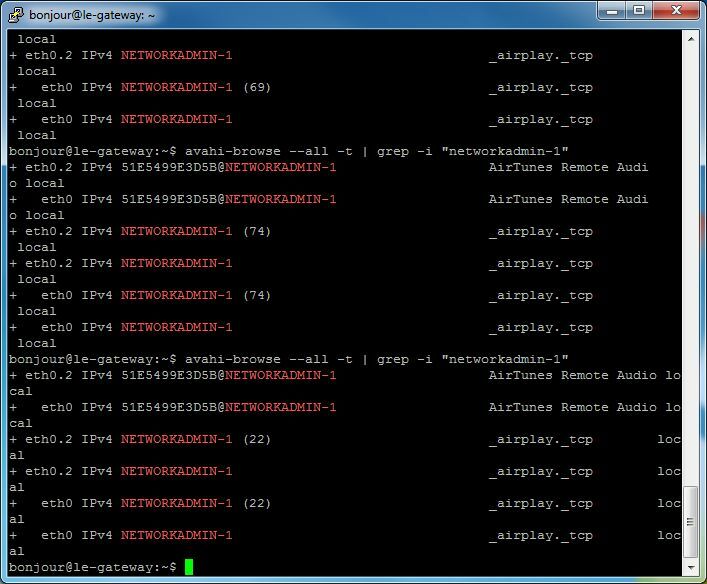 I have one vlan with desktops and another with wifi and I'm attempting to get airserver on desktops to work for mirroring I devices on the wifi. I can't ping / trace / resolve any .local either? mDNS only works on the local subnet. Are both vLANs part of the same subnet? Otherwise it won't work. an apparently non-local source address will probably be ignored." Yes but I thought avahi can reflect to all interfaces? They're both based on the same standard which works within the scope of the local subnet. I've never set up/worked with/used avahi, so I don't know if it extends the scope of ZeroConfig, but the standard only works within the local subnet. Have you looked into wide area bonjour / DNS-SD? I think that mDNS can do multicasting over several subnets if you use DNS-SD. Theoretically, though, you could configure a router to pass packets bound for the multicast group 224.0.0.251 between your two subnets, which should do the right thing — assuming you don’t have NAT involved. Whether and how you can do this depends on the type of router you have sitting between the wireless and wired networks. Joel Knight wrote something about this as well, specifically using AVAHI. In fairness I've read a lot lately on it (ive read that knight blog for instance), set up a Linux machine and tried avahi (then discovered it's probably not possible to do without layer 3 switches) then I remembered I had a pfsense box (alix) and thought i'd give that a try and this has failed also, nothing much has helped so I'm probably going to have to go down a split domain route :( . Hopefully that you can find a solution. It seems to me that Joel Knight's solution is the easiest, because you already have access to avahi in pfsense. If you can set the reflector functionality in your avahi-daemon.conf as he has done, that might suffice to get things working as you require. 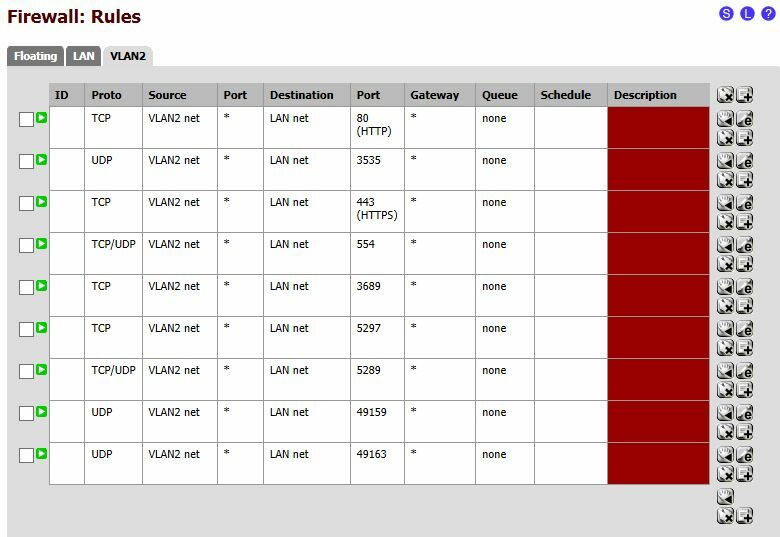 Have you also tried setting your vlans as Knight has? If it's any comfort, I'll be trying to do the same thing next week. I am physically separating my 10.0.1.x/24 and 10.0.2.x/24 subnets, and we are a 90% Apple/Mac shop. Not sure if I'll implement the Avahi package on pfSense because it's an Alpha release for 1.2.3, but if I get anything to work I'll post back. This was the problem I had with Ubuntu and avahi, the reflection didn't work (quite possibly because I'm not running L3 switches, the number keeps increasing. I thought I could use the pfsense box as a router instead of forking out for an expensive l3 switch, looks like I may need one! I completed the physical separation of my 10.0.1.0/24 and 10.0.2.0/24 networks this past weekend. The 10.0.1.0/24 network has the bulk of the mDNS devices on it, and it is a cheap unmanaged GigE switch. I just installed the avahi package in pfSense. It seems to be working okay. There were some interesting log entries generated during install, but nothing to indicate that anything was wrong. Seems to work okay. No major issues to report. I wish the package would move out of alpha status because it seems fairly stable. Sounds great! So you only installed avahi, nothing else? Did you bridge your vlans? I don't have any vLANs. I did at one time have both LANs on the same managed switch but decided instead to move them to a different physical switch. Both LANs can talk to each other, there are no rules preventing communication. The challenge that avahi solves is mDNS's inability to communicate across different subnets. It's not in its spec to do that. avahi solves that problem. I didn't really need to make the change or install the package other than to support a minority of things. Setting avahi up is very easy. Select the interfaces you want it to work with and turn it on. 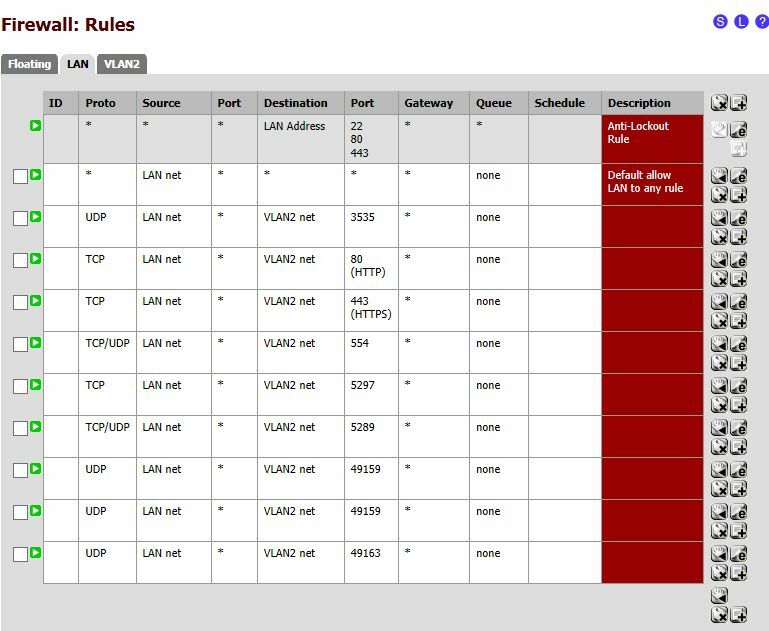 So in short, no firewall restrictions between LANs, avahi extends mDNS across both subnets, install is a breeze.